Whether it’s going to be called the Nexus 4, Nexus G or Optimus Nexus it’s now pretty much a sure thing that LG is going to be Google’s next Nexus hardware partner. We’ve already seen hazy photos of the rumored device making the rounds but now the folks over at the Belarusian Onliner got their hands on a pre-production LG Nexus and just published a bunch of beauty shots of the LG Nexus. 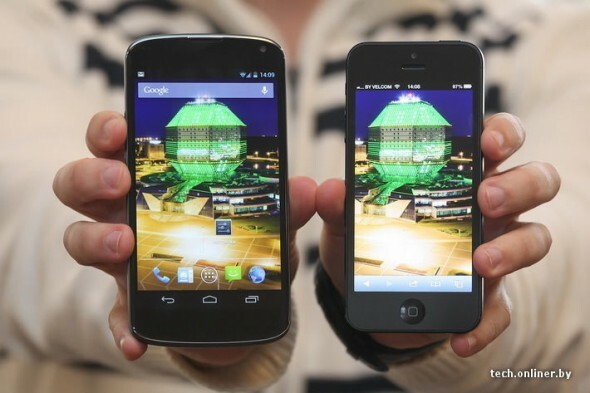 They’ve even done us the favor of doing a side-by-side comparison with the iPhone 5. The LG Nexus 4 device going by the model number E960 (a.k.a. Mako) will feature a 4.7-inch display with a 1280 x 768 resolution and run on a 1.5GHz quad-core Qualcomm Snapdragon S4 SoC and 2GB of RAM. The device Onliner got hold of came with a relatively paltry 8GB of internal storage and an 8-megapixel rear camera, though we’re hoping that at least the former will get a bump up in the production model.